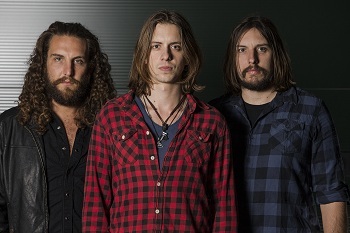 Following their rapturously received headline tour in October 2012, and recent Best New Band nomination at the 2012 Classic Rock Roll of Honour Awards, Australian rock band TRACER return to the UK for 4 concerts in April 2013. The tour will coincide with the follow-up to their debut album Spaces In Between. Read the official announcement HERE. The new, as-yet-untitled album will be produced by Kevin Shirley (Led Zeppelin, Iron Maiden, Slayer, Silverchair, Cold Chisel), and is planned for late March/early April release. Tracer’s 2013 UK tour starts at London’s Scala on Tuesday 9 April. Tickets will be made available as special 48-hour Planet Rock radio pre-sale from Wednesday 10 October. Fans who take advantage of the Planet Rock pre-sale will get £1 discounted from their ticket. A £1 ticket discount pre-sale is also available from www.ents24.com on Thursday 11 October. Tickets will then go on sale to the general public on Friday 12 April from the 24 hour box office: 0844 478 0898, www.thegigcartel.com. Tracer is comprised of Michael Brown (guitar, vocals), Andre Wise (drums), and new bass guitarist, Pat Saracino. The band has attracted the attention of the British rock and guitar press including Classic Rock (New Band of the Month), Total Guitar, Metal Hammer, Rock Sound, Guitarist, Fireworks and Powerplay. Their Too Much video has amassed close to 100,000 YouTube hits.